Recent LSATs Explained includes complete explanations for LSAT PrepTests 52-61. Never before available by retail, this book explains each question from LSAC's 10 New Actual, Official LSAT PrepTests, available separately. For years, prep companies have made explanation books like this available only to their students taking $1,000+ prep courses. This book includes complete explanations to over 1,000 LSAT questions. Students studying for the LSAT on their own often have difficulty pinpointing the exact logic operating on every question on the exam. This book explains the thought process necessary to solve each question. Importantly, we include not only why the right answer is right but why the wrong answer is wrong. To improve, students need more than the the right answer -- they need to understand the logic needed to get there. Next Step Test Preparation, a leader in one-on-one LSAT tutoring, helps hundreds of students individually on the LSAT each year. These explanations were compiled by our top instructors including graduates of Harvard Law School, University of Pennsylvania Law School, and the University of Chicago. 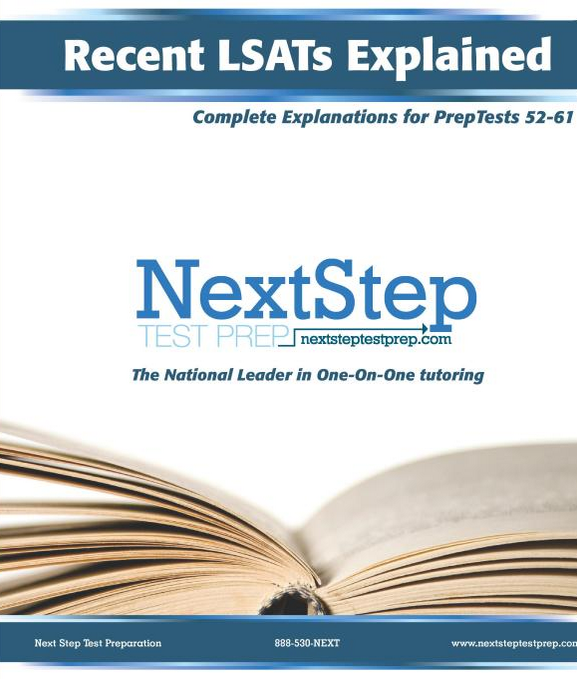 Recent LSATs Explained includes explanations for every question. Logic games include detailed walk-throughs on creating diagrams and finding inferences, in addition to modelling how to work through each question. Please note actual tests are not included in this book -- students should also have 10 New Actual, Official LSATs.